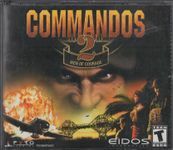 Commandos 2: Men of Courage is the sequel to Commandos: Behind Enemy Lines and Commandos: Beyond the Call of Duty. The game places the player in command of a squad of commandos and various allies as he sneaks behind enemy lines to accomplish his objectives. The action stretches from 1941 to 1945 and takes place on both the Western Front against the Germans and the Pacific theatre against the Japanese. Source: Wikipedia, http://en.wikipedia.org/wiki/Commandos_2:_Men_of_CourageCommandos_2:_Men_of_Courage, available under the CC-BY-SA License.